We walked some of the 30+ acres off of Hwy 187 to confirm the property lines and to see what the lower ridge was like before signing on the dotted line. We have a good amount of frontage road if we decide to put some type of commercial building in. For now we want to put the cabins back further on the property, with lots of space between them so everyone can enjoy the nature around them. There are lots of spots to build cabins on the upper and lower sections of the land. Below are some of the photos we took when we surveyed the land. We have Hwy 187 frontage for easy access. Blake with surveyor at a clearing on the upper ridge of our property. Surveyor and Jack (our realtor) walking the land. Road winding through upper Ridge. If you look behind the trees you will see Jackson, our realtor Jack’s dog, checking out the land with us. 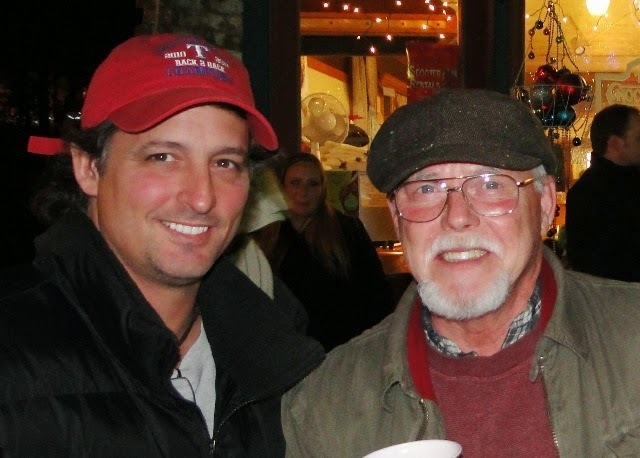 Blake and our realtor Jack Cross at the Eureka Springs Christmas parade. We are excited about the opportunity and look forward to the day we can have you come hang out in Eureka Springs with us! PreviousFinding Eureka Springs… Accident or Fate? NextA road to the lower holler and some build sites cleared!